My Wordless Wednesday photo was taken on Sunday. November is going to be a whirlwind month, and we had some free time, so I decided we'd take our annual Christmas card photo. 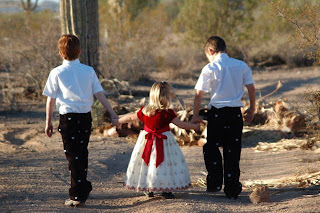 We dressed up the kids and drove them out to the desert -- and then stopped at a local school (hence the grass . . . no, I don't understand it either, Ann!) We ended up taking 253 shots (the perils of digital) and I think I found the one we'll use for cards. That shot was one of the last shots taken and I love how they're all resting on the grass, patiently waiting to see what crazy thing Mom suggests next. They were truly good sports! Those are skulls and crossbones on their pants. Yep, my kids are pirates. Did you play Wordless Wednesday? Then don't forget to tell your story on Tell Me Thursday! That is such a cute picture! I haven't even thought about Christmas cards!! Sweet on the pirate pants. I gave Pete and Audrey a pirate onsie for the baby they are expecting in January. Also got them something useful from the registery. D. isn't complaining because since I had to pay for shipping I got us new pirate shirts. What a great shot for your Chirstmas Cards. It will help those that receive remember to stop and enjoy the holiday moments.